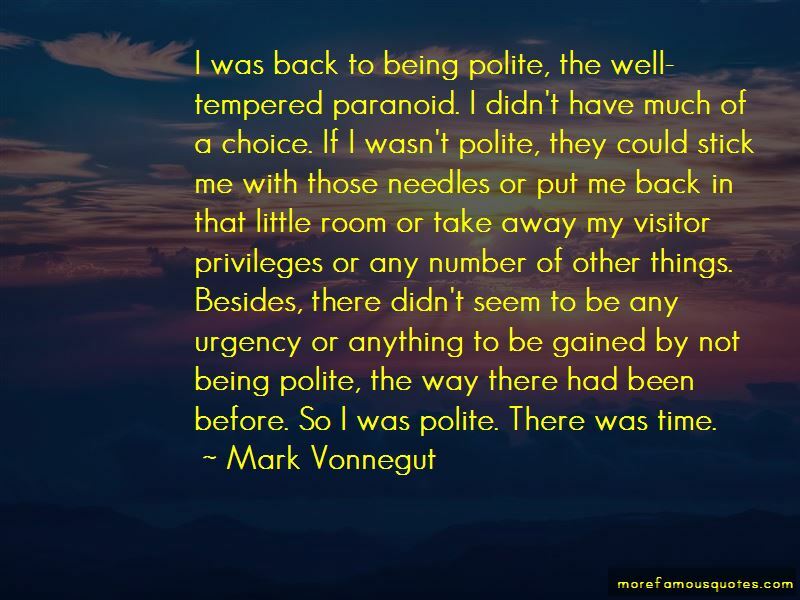 Enjoy the top 62 famous quotes, sayings and quotations by Mark Vonnegut. Reading and writing are in themselves subversive acts. What they subvert is the notion that things have to be the way they are, that you are alone, that no one has ever felt the way you have. I often took him as one of God's little jokes on me. When I was in desperate trouble, what saved me from a fate worse than death? To what do I owe my life? Was it love, affection, understanding, friends, wisdom? No no no. It was a man who looks like a poor copy of Walt Disney, drives pink Cadillacs, wears baby-blue alligator shoes, and appears to have the emotional depth of a slightly retarded potato. “Are people who have been crazy held to unfair standards? “The first meeting I really remember with the good doctor was when I was starting to be able to speak English again and making a brave attempt to regain some of my dignity. Trying to be very sane, I went up to him and asked if he was my doctor. He said he didn't think so. "You're Dr. Dale, aren't you?" “The other day a patient told me that he had gotten into what was a very good college. 'It's not Harvard,' he said. At the time I would have endorsed the radical notions of R. D. Laing that insanity was a sane reaction to an insane society. Leaving the insane society to set up an independent self-sufficient commune seemed like a very sensible noble brave thing to do-plus it figured to be good for my mental health. Had I gone crazy in Boston or New York I would have blamed my culture and society without a second thought. The arguments were all packed, polished, and ready to fly. 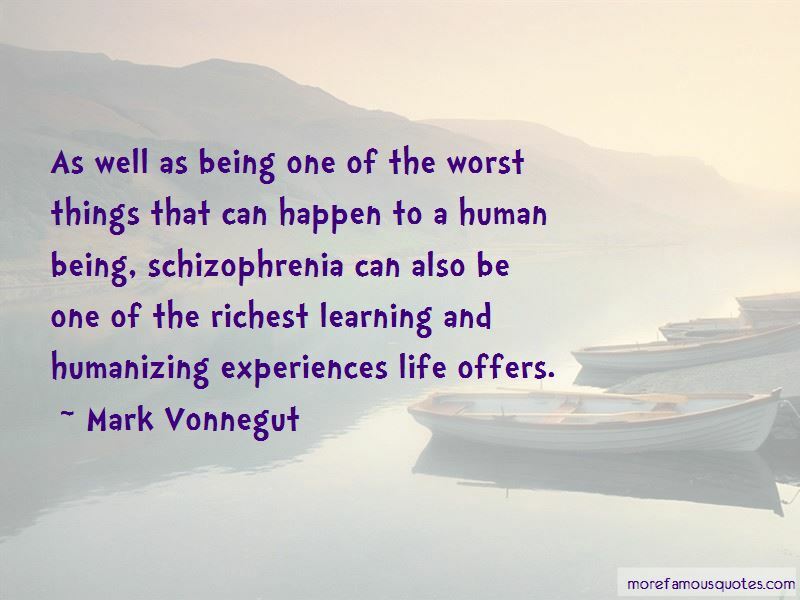 As well as being one of the worst things that can happen to a human being, schizophrenia can also be one of the richest learning and humanizing experiences life offers. Colds, ulcers, flu, and cancer are things we get. Schizophrenia is something we are. 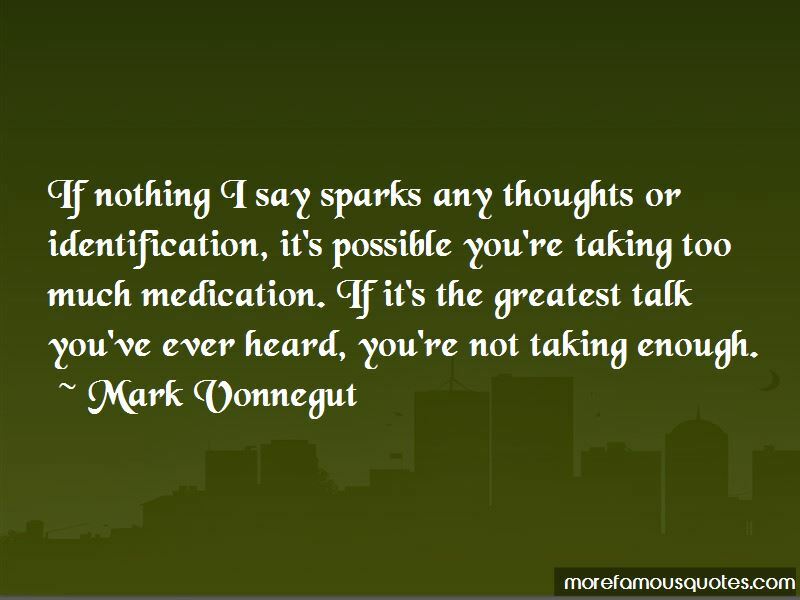 Want to see more pictures of Mark Vonnegut quotes? 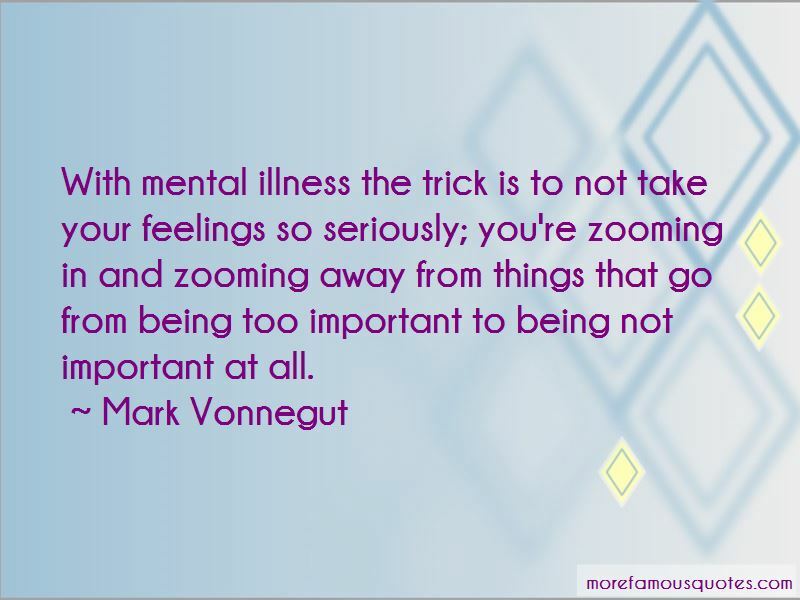 Click on image of Mark Vonnegut quotes to view full size.